Message Are People of Prayer... Delusional?? Are People of Prayer... Delusional?? Lord, You have told us here at Heartdwellers that the world You live in, the world of the spirit, is Reality. More real even than the chairs we sit on and the things we touch and see with our natural senses. Please open the spiritual eyes of Your people. Let them understand these things so that they, too, may become mighty spiritual intercessors for Your Kingdom, and not fall to Fear or the lies of the enemy that 'these things are just your imagination.' Amen. As always, the Lord had a plan for all this timing. This morning during my prayer time, the Lord called all of us yet again into serious prayer over our President. I've written that time out for you, to add to what Clare had been thinking. But first, I want to begin with her words. "Recently, I had a run in with someone who denounced our life of intercession as delusional. Why? Because we believe in Simon's cross of suffering. We believe in signs from Heaven. We believe in words from God and we see all of these things as normal and foundational in our walk with Christ. "Ezekiel took quite a blow for Air Force One right after it had taken off from Iraq headed north, around Christmas time if you remember. I mentioned this in an earlier message. I was amazed, really, when this person said, "No. There was no missile. There are no Chinese in Honduras." And a few other things we had been praying against. To them, all of this was fantasy-land. "And frankly? I can't blame them. "The life of an intercessor is one of living in God's world more than man's world. And it is necessary, because our prayers stop things forming in the spirit from becoming reality to others. And if we mention we are praying for such and such, and it sounds absurd, when it doesn't happen, of course that only confirms that we are a nut case. Or a false prophet worthy of being stoned...by certain Christians. But at the very least, worthy of being called delusional. "The Lord gave us the true story of Jonah to illustrate the point that a prophet's warnings are sometimes cancelled because of their complete and abject repentance. "And also, in I Corinthians 2:14 the Lord explains why it is so difficult for some to believe what we see in the spirit. "The natural man does not accept the things that come from the Spirit of God. For they are foolishness to him, and he cannot understand them, because they are spiritually discerned." "As far as the perception "there was no missile, there are no soldiers or Chinese" and other things we have seen in the spirit, it might help to understand that an intercessor does not live in the 'real' world. They live in the pre-real world, or the remote real world. The world of thought, images, intentions, trends. More or less energies that propel and manifest in the "real" world and the inspiration for the creation of man's deeds. "It is a well-known fact that the military itself has remote viewers--men and women who see what is going on on the other side of the world, without even being there. This is the world of the spirit. I like to call it the pre-world or pre-creation, because thoughts and images precede the manifestations of reality. As we know it. "And on the surface, to some not understanding the requirements of this calling, it may seem that a person who spends 3-5 hours in prayer, or is confined to bed by sickness, is just lazy and doesn't want to work. "The reason Ezekiel and I are called to so much prayer is to be drawn into that world of possibilities, probabilities, and the pre-event world. Once we settle into prayer, we begin to loosen our grip on the so-called 'real' world around us and enter into remote viewing, or the pre-creative world of God, the spiritual dimension. "This is a very different life from those who function primarily in the physical world, which is thought that has now become action and part of the seen, felt, universe of day-to-day life or what most call reality. "So, there is a lot that looks flakey to those who don't dwell in this world, and it does seem absurd. I am not trying to justify what I believe is real. I am merely explaining to you why Intercessors seem so strange. We are called to dwell in His world with a substantial investment in time, praying, studying Scriptures and signs. "This is our perspective, those who are called to be intercessors. The Lord reveals His thoughts and concerns on a very intimate level, because He needs them to enter into prayer and spiritual warfare to save His Body, to prolong life on Earth before the wrap-up of Revelation. "IF they do their jobs properly, the danger is averted, and time is extended. That is why it seems so flakey. Just like Jonah got so angry at God because he prophesied to the Ninevites. And rather than having the satisfaction of seeing his warning ignored and all of them destroyed, they repented and heeded his warning. So, the prophesied judgement never landed. "This is also why people are so disillusioned by the Rapture. "For instance, an update on intel from our source said that the Chinese have been withdrawing. Now it is the Sandinistas, drug cartels, Mexicans and terror groups mixed in with Honduran soldiers that is advancing while the Chinese have been quietly pulling out. "The Chinese president warned his people the day before yesterday, (Well, it would be two days ago now.) "Prepare for war." And our President presented the Ohio-class subs to them in a muscle-flexing gesture, as well as calling our military back to the mainland from the Middle east. And that you can find on the media. "Communism is a strong party in Honduras and there is in fact quite a large population of Red Chinese. I believe these changes took place because of the ardent prayer of many. The tears, the pain, the sufferings, and all inconveniences and oppositions are occasions of great offerings in intercession." I wanted to add in here to what Clare has already shared, an episode that happened just this morning, between Ezekiel, Clare, I and the other Intercessors. At 12:05 this morning, our prayer warrior whose wife has been in and out of the hospital so often, texted me: his wife was being rushed into emergency surgery. Within 5 minutes of sending that message to our prayer Team, Ezekiel called me--deep into what the Lord allows him to suffer, even still, for His sake. The moment I answered the call, ALL of the... I'll call them pressure points... in my own body flared up. That's always a sign prayer is needed. Typically, we are called to pray for maybe 15-20 minutes...and then most of the symptoms will ease up, and we know that we have done what the Lord asked and have prayed for sufficient time. This morning was not typical. It was much more like the kind of prayer we were experiencing a year ago, when Ezekiel was so, so very sick. 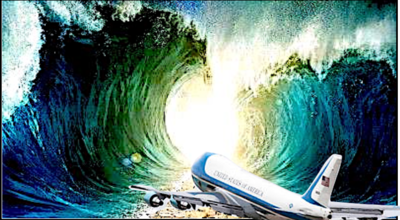 An hour into prayer, at 1:11 exactly, (that's my numbers for Papa God) I got a text from a link I have from President Trump's office: he was RIGHT THEN boarding Air Force One to fly to Texas and the southern border. And RIGHT THEN, instead of getting lower--Ezekiel's pain rose sharply. And so did mine. I try not to ask the Lord to tell me what's going on in the spirit very often. I have found that my anticipation can get in the way then, and my focus will shift to 'facts' instead of intent. But this morning I heard a shift in Holy Spirit's words as I was praying. Soon, I could see a sort of tube of Light running directly from Washington DC straight across the country--to the Border. It was encircled by a shield--forming a type of tunnel that the plane was flying through, in protection. As I continued to pray, my attention was shifted to the border itself, and I heard Holy Spirit praying strongly over BOTH sides. Praying against traitor soldiers that might be mingled in with our soldiers. Praying against those who are still coming through and up against the open parts of the border. Praying against this massive group of men, and who else they had implanted in it, that are still coming to the border. As we continued to press in, my attention was brought back to the interior of Air Force One. I felt it. I heard it in Holy Spirit's words. There was the potential of danger there. A mechanical malfunction? A traitor? I couldn't be sure--but I found myself praying a covering of the Blood of Jesus over the pilots and Trump himself. And I heard some very strong prayer up from Holy Spirit around every other soul in that plane with them. We were now well into the 2nd hour of prayer, and things were NOT easing off yet. Ezekiel's pain was still rising. He told me at one point that he felt like he was being drawn and quartered, literally. Having his limbs torn asunder. He told me the pain then went to his heart, and that he was near passing out. Clare had already administered all the physical help she could, and she had gone to pray the Mercy Chaplet at her own altar. I began to hear Holy Spirit saying, 'Moshe! Moshe!' And wondered to myself, 'Is He calling on Moses to come pray with us?' Immediately, in my vision, the plane was no longer flying through just a tube, but as though through... Well. The Red Sea--as it is often portrayed. I could see a bare path of ground beneath the plane. But on either side, great walls of some substance rose up high, towering above the plane, obscuring anything from reaching it that wouldn't have come from directly above it. Something had again shifted in response to our prayers--and I knew then: he was going to make it through. Safely. Within minutes after this, Ezekiel's pain began to ease off. My own began to stop. Within 5 minutes, I got a text from our prayer warrior that the surgeon had come out to speak to him, his wife's surgery went very well. And she should be fine. Coincidence? Is this just coincidence?? To echo what Clare was saying: DID anything happen this morning? WAS there a danger somehow to Trump and Air Force One? We will probably never know from the news; maybe not even the alternative news. Even as I write this, I don't know if he has yet arrived in Texas. But like Q is fond of telling his readers--when does coincidence become impossible? I'll finish this message now with the words Clare had written. "In any case Ezekiel and I, our 30 prayer warriors and 15 priests are all praying that more time will be granted and that there will be a great movement of reconstruction of countries that have been so corrupt. Putting an end to child trafficking. Slowing the flow of drugs. And a time of peace where we can all flourish in our gifts without facing the constant threats of Communism and the Clay Feet. "This is why we dedicate our lives to prayer." I'm also going to put at the end of this article a link that Clare had found about China's intentions that she felt was very well vetted. And I would agree to that. So, we invite you to come, prayer warriors out there. Come. Don't worry about what people think, or what they say. Don't worry if the prayer and the things you see in the spirit are ever confirmed. Our Jesus knows. Our Papa God knows. Our Holy Spirit knows as He prays through our lips. And our goal is to be obedient to His will. Not others. May the Lord bless you today, Heartdwellers.